The Beaver Creek Rendezvous is a three day hunting experience specifically designed for the disabled set in the beautiful wilderness surrounding Ekalaka, Montana. 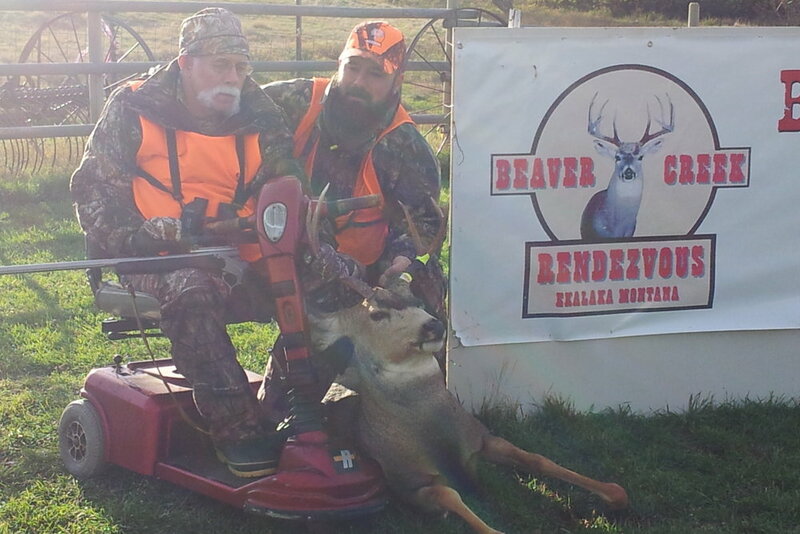 Every October, six disabled hunters and their able-bodied companions are invited to join a deer hunt. Our experienced guides and other volunteers are truly dedicated to making possible the dream of full participation in a genuine hunt experience in the wild areas of Montana. We recognize that many may not have thought it possible to join an able-bodied companion on a hunt, and we focus particularly on those who have not yet enjoyed this great outdoor experience. Our guides are dedicated volunteers that are highly experienced and qualified, including those who are in the medical profession during the rest of the year. We take every precaution to make this hunt experience genuine, exciting, and safe. To learn more about who we are, how we put on the hunt, how you can help, or how you or a disabled loved one can hunt, click the links below, or in the top right corner. Find out about who we are, what we do for disabled hunters, and how you can help, click here. Would you or your disabled loved one like to join us for our next hunt? To see more details about the hunt, and to apply, click here.